A recent newspaper story about a Green Turtle showed a Hawksbill Turtle in the photograph. What is the difference? Three species of marine turtle have been recorded in the Cook Islands: the Green Turtle, the Hawksbill Turtle, and the Loggerhead Turtle. Each has an oval shell (or carapace) covered with plates (or scutes). The Green Turtle (Chelonia mydas) is rare in the Southern Group, except on Palmerston where it is common. It is uncommon to common throughout the Northern Group. Most communities recognize that this traditional food is endangered and have started to implement various conservation measures. Its names include: ‘Onu, Onu, Honu, Fonu / Fonu Pokaikai, Wonu, and Turtle. Green Turtles spend their adult lives feeding on seagrasses and seaweeds in Melanesia. Every few years the females migrate back to the beach on which they were hatched to lay their own eggs. Most breed in Melanesia, but a few migrate further eastward to their birth beaches in Polynesia - Tonga, Samoa, Cook Islands and French Polynesia. Green Turtles reach 40cm (curved carapace length) around 10 years of age; 80cm and sexual maturity at around 30 years; and 100cm at about 50 years. A few reach 140cm and are thought to be about 100 years old. Mature males have a long tail that protrudes well beyond the edge of the shell. 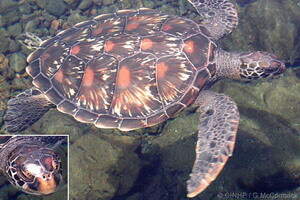 The Green Turtle is identified by several key features: (1) shell midline-plates are five and do not overlap each other; (2) shell side-plates are four; (3) margin-plates on the posterior section of the shell have the hind-corner rounded and not protruding; and (4) forehead scales are one pair. The Hawksbill Turtle (Eretmochelys imbricata) is rare throughout the Cook Islands. Names include: Onu, ‘Onu, ‘Onu Una‘i, Honu Tara, Fonu Kokorove, Wonu Kea, and Torta. The Hawksbill is mature at about three years with a carapace of 50cm. They grow little after reaching maturity, and typically live a total of ten years, although some may live 20 years and a length of 90cm. They are omnivores feeding on sessile reef animals, especially sponges, and some seaweeds. They are solitary nesters and often remain in the general area throughout the year, although some wander great distances. Like the Green Turtle the Hawksbill has five midline-plates and four side-plates, but they differ in that each plate conspicuously overlaps the one behind. The margin-plates differ by having the hind-corner arrowlike and protruding. 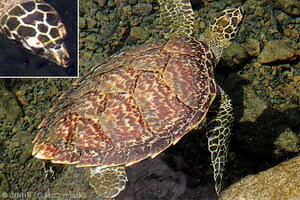 In contrast to the Green Turtle, the Hawksbill has a long, narrow snout, and it has two pairs of scales on the forehead. The Loggerhead (Caretta caretta) is very rare in the Cook Islands. It is easily confused with the Green Turtle. Loggerheads reach maturity at about 80cm carapace length when they are 15to 20 years old. They sometimes live 50 years and reach 120cm in length. They are carnivores throughout live, feeding on bottom-dwelling invertebrates, such as crabs and shellfish, and on small pelagic animals. Easily recognized differences separating the Loggerhead from the Green Turtle are its 5-6 carapace side-plates (vs. 4 in the Green), and its two pairs of scales on the forehead (vs. one pair). To accurately identify a turtle you should record four things: carapace midline-plates (overlapping or not overlapping); carapace side-plates (how many); carapace margin-plate, the hind-corner near the rear of the shell (rounded or arrowlike); and forehead scales (one pair or two pairs). McCormack, Gerald (2005) Identify Cook Islands Marine Turtles. Cook Islands Natural Heritage Trust, Rarotonga. Online at http://cookislands.bishopmuseum.org.